I recently found myself in need of some shoelaces and decided it would take less time to make them than to find an interesting, colorful pair. Turns out that they’re fun and easy to make, and they require very little fabric. And they would make a great little stocking stuffer! I used a yellow polka dotted sateen from the Little Lisette collection. You’ll need less than 1/4 yard for each pair of shoelaces. 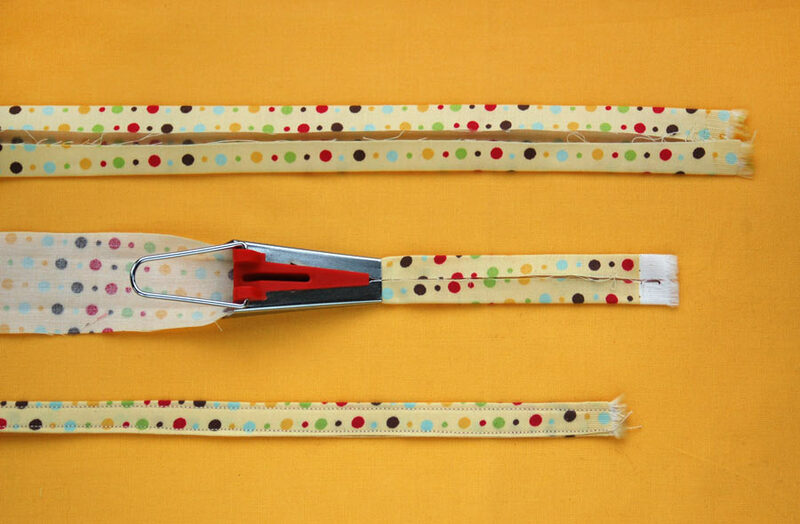 First, cut several 1 1/2″ wide strips of fabric from selvedge to selvedge. I used three strips for my sneakers, but you may need more for shoes with more grommets. Stitch the ends of the strips together to make one big long strip, and trim the seam allowances to about 1/4″ before pressing them open. This will prevent the seams from getting too bulky to pull through the grommets when lacing. If you have a bias strip maker, the next step will go really fast. You can just feed the long strip through the bias maker and press the folds. Then fold the strip in half and press again so the cut edges are completely enclosed. If you don’t have a bias strip maker, fold and press the strip in half lengthwise first. Then unfold it and press the edges to meet at the center crease. Re-fold the strip at the center crease again so the cut edges are completely enclosed. Once the strip is folded and pressed using either of the two methods above, edgestitch both sides to finish them. Then you can trim the long strip to the proper length to make two shoelaces. You could use an old shoelace as a guide, or test the length by feeding it through the grommets and cutting it to fit. I wrapped a little bit of Japanese washi tape around the ends and sealed the tape a little clear nail polish so it would be easy to thread the ends through the grommets. One stocking gift done. Just think of all the fun prints and colors you could use for this project! Update: I’m happy to report that this project is now available as one of my Creativebug workshops. Come join me there to make a pair together! Very cute! I never thought about using fabric for them. I’ve thought about using ribbon. I was shopping etsy for some sewing supplies one day and saw that they sell the little tips that go on shoe laces. It’s something you can apply at home. Just thought I’d share in case the tape doesn’t work out to be a long-term solution for you. A search for shoe lace tips or something like that would probably turn them up. Samantha, that’s wonderful to know. I’ll definitely look for shoelace tips as a product. It never even occurred to me that they might be something you can purchase. Thanks! You can also use heat shrink tubing (the kind electricians use for electrical joins) for your aglet (that’s what the shoelace tip is called. Great tutorial, I’m going to go raid my scrap bin now! This is so fun! 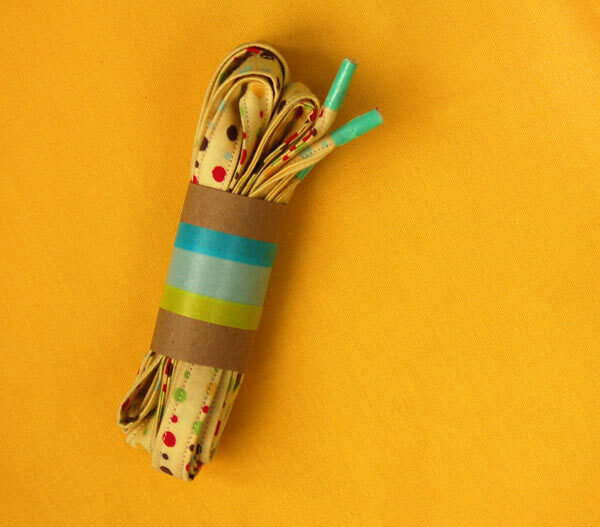 I will have to make some cute shoelaces for fun presents! You are so smart and they are so cute. What size bias maker did you use? Here is a tutorial on creating a thread and glue (or nail polish) aglet. If I have more “creative time” I am so making these for my sister in-law. Thanks so much for the tutorial! OH MY GOSH! Every year I make my family a few small things for thier Christmas presents–this year I have a very picky tween who has given me such frustration I can’t even express! BUT you the miracle worker have found for me (I know more than just me but this is sooooo perfect if feels like just for me :o) the most perfect gift for this turkey I am sooo over joyed–haha you could say I am now feeling the Christmas spirit!! !